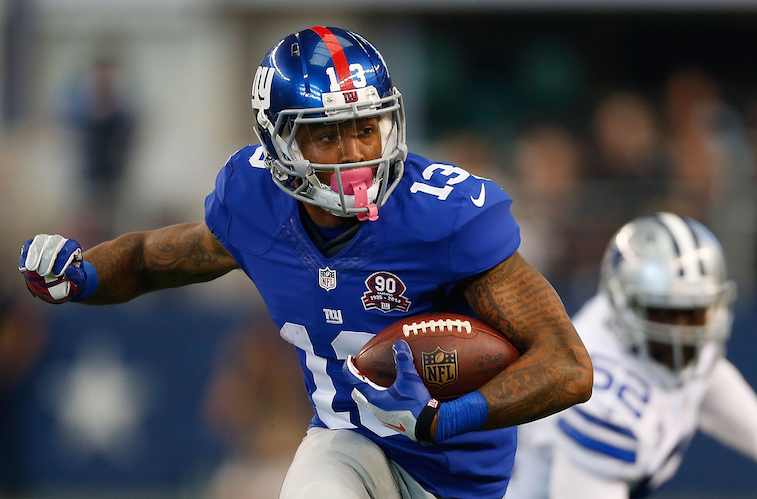 Can Wide Receiver Odell Beckham Jr. Really Play MLB? If there’s one thing we’ve learned about New York Giants wide receiver Odell Beckham Jr., it’s that he only needs one moment to show you just how truly special he is. When a video of the superstar throwing straight heaters from the mound at Provident Bank Park during a charity softball game went viral, the Rockland Boulders — a minor league club of the independent Can-Am League — did not hesitate to offer the Pro Bowler a rookie contract. For those of you who may think this is a joke, we assure you that couldn’t be further from the truth. There is a (semi-)serious belief that the exciting playmaker could cut it in the world of pro baseball. After all, according to his teammate Prince Amukamara, No. 13 was tossing strikes at 90 miles an hour. And that was with a softball. Therefore, we have to ask: Could Beckham Jr. actually play in the big leagues? In the modern world of sports it would seem unfathomable that an athlete would attempt to play two sports at once, but it certainly isn’t out of the realm of possibility. 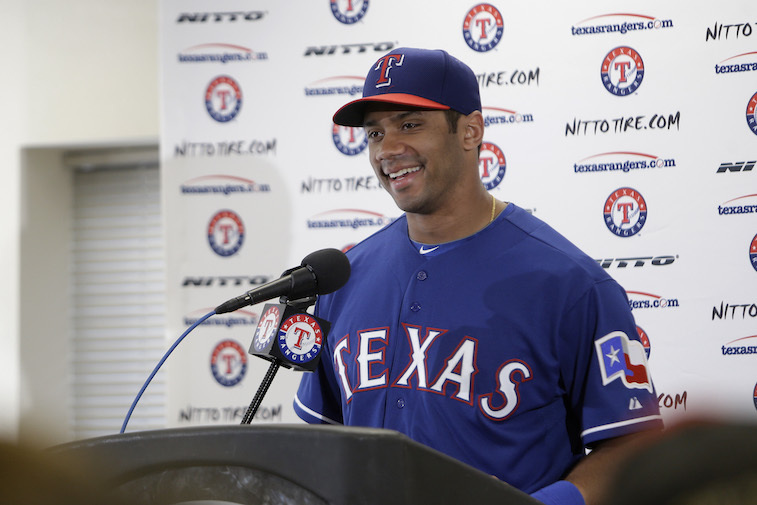 After quarterback Russell Wilson (pictured above) had his rights acquired by the Texas Rangers — and strutted his stuff at spring training — it’s impossible to deny that certain athletes are gifted enough to perform at a high level in multiple leagues. Not only is the Super Bowl winner unwilling to kill the dream of playing two sports, but as he said during an appearance on HBO’s Real Sports with Bryant Gumbel, he isn’t the only one who wants to see him on the baseball diamond. What does this have to do with Beckham Jr.? Well when you have the whole package, people take notice. And the playmaker out of LSU proved he had the goods. “We were very impressed with Odell’s mechanics in the video,” said Bobby Jones, Boulders Pitching Coach. “He’s shown his ability to catch a ball on the gridiron and after seeing his prowess on the mound, I am optimistic that he has the tools to develop into a quality pitcher” said Jones, who played in Major League Baseball with the Mets, Red Sox, Padres and Rockies. After taking a look at the video ourselves, we have to admit, we came away impressed. For a guy without any background in the sport, Beckham Jr. looked like a complete natural on the mound. If a current coach, and former big leaguer, sees potential, who are we to question it? Do we think that Beckham Jr. will actually sign the minor league contract? No way. And we’re not the only ones who share that opinion. But that doesn’t mean we believe the stud receiver doesn’t have the ability to make strides in the world of baseball. This kid is more than just a freak athlete. And that’s what makes him so scary on the field. 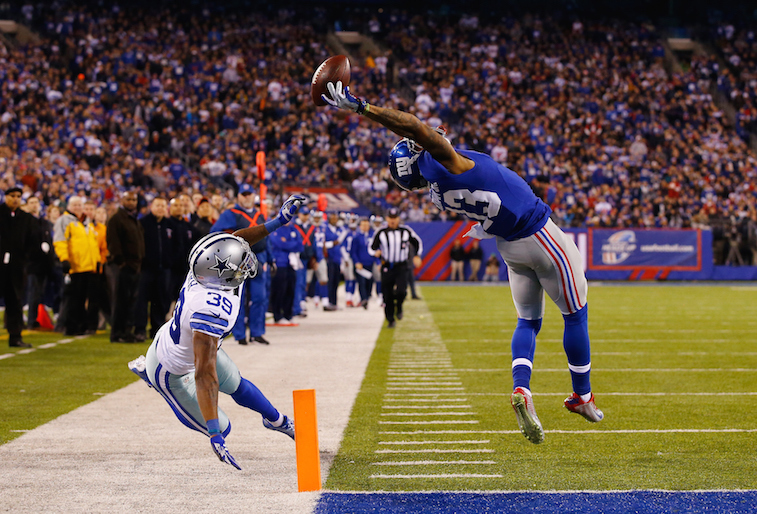 The fact is, Odell Beckham Jr. is generational talent. And you can’t put a ceiling on individuals like that. They’ll simply bust right through it. With the right training, coaching, and guidance, we have no doubt this New York Giant could see his name on the back of a baseball jersey. If that were to ever happen, you better believe we’d be all over those tickets. All information is courtesy of ESPN.go.com, rocklandboulders.com, and CBSSports.com.